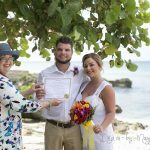 Here are the answers to some of your questions about the documents you will get after your Cayman Islands wedding. 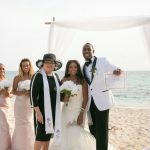 To be legally married in the Cayman Islands, you must be free in law to marry, the wedding must be performed by a licensed Civil Registrar of Marriages/Marriage Officer between the hours of 6am and 8pm, before at least two witnesses. Your wedding must be open to the public, for example you can't get married behind closed doors in secret. 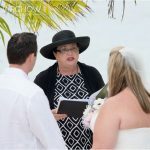 All marriages in the Cayman Islands are governed by the Cayman Islands Marriage Law, and must be registered at the office of the Registrar of Marriages, which is part of the General Registry (or public records office) located at the Citrus Grove Building, on Goring Ave. in George Town. Before your ceremony we will ask for certain information which we will need in order to prepare your Marriage Register and your certified copy of the Marriage Register. The Marriage Register is filled out in duplicate. The law requires me to keep the top copy in my Marriage Book, to file the duplicate copy with the Registrar of Marriages, and to give you a copy which is the certified copy. It is my responsibility to ensure that these forms are properly completed, and signed. In effect, it is my job to see that due diligence is done and that your wedding is conducted according to law and your marriage is legal. Number: Each Marriage Register has a unique number in the top left hand corner, and the initials of your marriage officer. This number is helpful if you ever need to replace your Registered Marriage Certificate. When Married: This is the day, month and year. 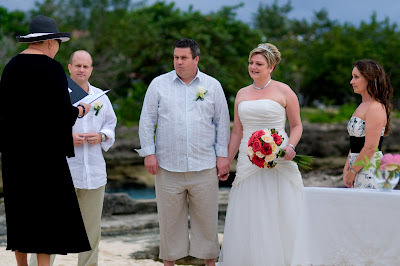 Sometimes if I am doing several weddings that day I will also put the time of the wedding ceremony. Name and Surname: This is completed exactly as it is in your passport. If you had your name changed by deed poll or restored to you after a divorce, this proof of name change must be provided. Condition: This means, "never married", "divorced" or "widowed". The word "single" is not acceptable under the law. The words "bachelor" and "spinster" are acceptable, but since I find them antiquated I never use them. Calling: This means your occupation. If you are self-employed you need to be more specific, eg self employed - construction trades. If you do not work outside the home, you may put "homemaker". Most people just use their job title, eg administrative assistant. Age: This is your age at your last birthday, and again we have to verify it from your passport. District and residence at time of marriage: This is the only difference between the Certified Copy you receive from me the day of your wedding, and the Registered Marriage Certificate we mail you once your marriage has been recorded at the public records office. The Certified Copy will have the name of your hotel, condo or cruise ship and the RMC will have your home address in your country of residence. Father's Name and Surname: This is a requirement of our Marriage Law. Since our law was written in 1963 before we had a lot of visitors coming to the island to be married, I can only assume it was intended to ensure that people who were closely related did not marry each other. If you chose not to have your father's name on your Marriage Register you may ask that we put "not stated". If your mother and father were not married to each other at the time of your birth, we can put your mother's name only, followed by the designation (mother). It is less usual but not illegal, for us to put the designation "unknown" under father's name and surname. 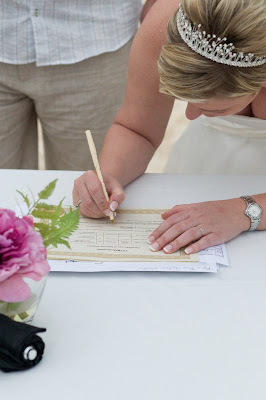 Signatures: Both the bride and the groom must sign all three documents. 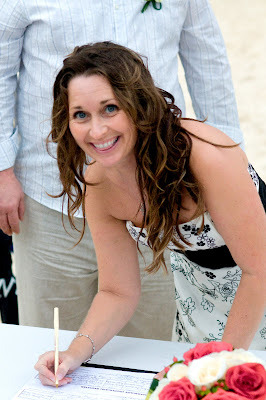 The bride cannot sign her married name at this point. She must sign her maiden name if she has not been married before, or her legal name if she has been divorced. 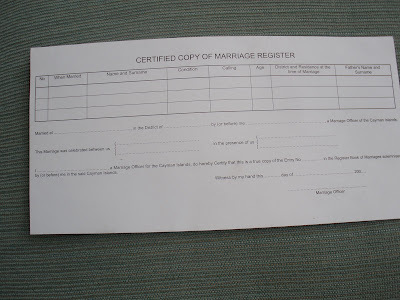 The fifth and last signature on your Marriage Register is that of your Civil Registrar of Marriages/Marriage Officer. 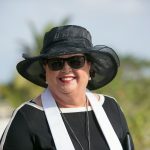 "I, V. Joy Basdeo, MBE, JP, a Marriage Officer for the Cayman Islands, do hereby certify that this is a true copy of the Entry No. 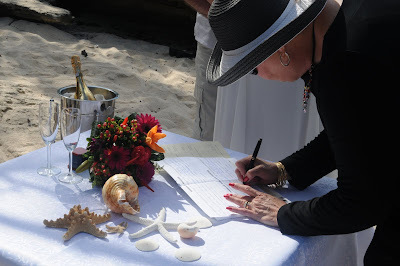 VJB *** in the Register Book of Marriages solemnised by me in the said Cayman Islands. Witness by my hand this ... day of ....................... 200..